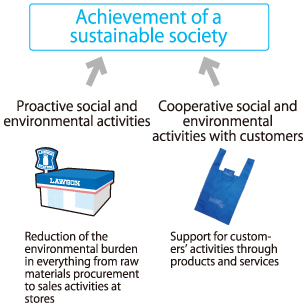 The Lawson Group seeks to contribute to achievement of a sustainable society from the following two main perspectives. First, we pursue activities that make proactive contributions to society and the environment. In particular, we are endeavoring to determine the volume of CO2 emissions released from our supply chain and installing the latest energy-efficient equipment in our stores as part of our efforts to reduce CO2 emissions from our operations. Second, we provide proactive support for our customers’ social and environmental activities by delivering eco-friendly products and services. We employ the ISO 14001 environmental management system to promote business activities that are considerate of society and the environment and implementing the PDCA (Plan-Do-Check-Action) cycle to promote a harmonious relationship with society and reduce the environmental burden. To promote the ISO 14001 Environmental Management System, the CSR Promotion Department of the Franchisee Business Support Division acts as a secretariat, and cooperates with the representatives of headquarters, the various areas and the Group companies responsible for CSV* promotion to conduct activities including managing progress with respect to social and environmental goals, providing guidance and assistance for stores and responding to internal and third-party audits. The representatives meet once a month, and hold the CSV Subcommittee that manages the progress and shares information, provides environmental education or takes other activities based on observance of laws and regulations. To ensure that the management system is functioning effectively, in addition to internal environmental audits conducted several times a year, the Company is subject to third-party audits. We are continuously verifying the status of our activities through such means and working to improve them. In FY2016, our management system was assessed by third-party auditors for the transition to the ISO 14001:2015 standard, and the certification was successfully registered. *CSV: Creating Shared Value, the creation of value through business activities that both address social issues and contribute to corporate growth. *1 Group companies not subject to ISO 14001 are also promoting social and environmental activities by setting their own targets and goals. Raising awareness and deepening understanding are essential to contributing to society and the environment. 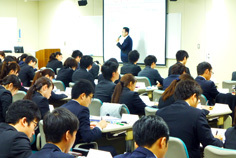 At the Lawson Group, we conduct social and environmental education and training for headquarters employees, franchise owners, store managers, and store crews. 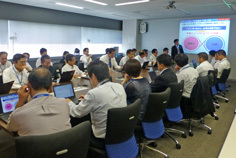 Beginning with training at headquarters for new recruits, training encompasses all Lawson employees and includes annual general environmental training via e-learning. 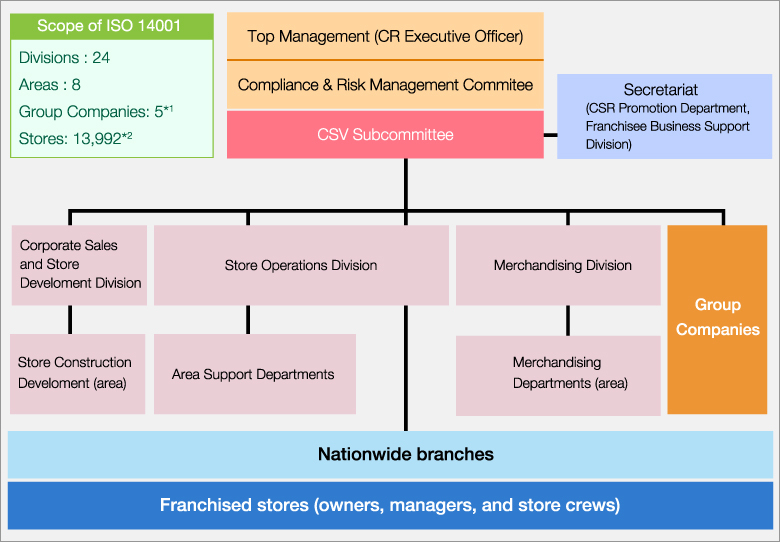 For franchise owners, store managers, and store crews, training is provided when new stores open as part of our Basic Management Course (BMC). Moreover, we take steps to regularly share information through in-house magazines and our Living in Harmony with Communities:Initiatives Report. Since fiscal 2012, moreover, we have been encouraging employees to broaden their knowledge by taking an external examination on the environment with the person responsible for promoting CSV taking the lead.